Protein Blend (Milk Protein Isolate, Whey Protein Isolate), Soluble Corn Fiber (Prebiotic Fiber), Allulose**, Palm Kernel Oil, Pecans, Cocoa, Butter, Water, Erythritol, Natural Flavors, Contains less than 2% of the following: Sea Salt, Baking Soda, Palm Oil, Cellulose Gum, Xanthan Gum, Carrageenan, Sucralose, Sunflower Lecithin. Protein Blend (Milk Protein Isolate, Whey Protein Isolate), Soluble Corn Fiber (Prebiotic Fiber), Allulose**, Palm Kernel Oil, Erythritol, Water, Butter, Almonds, Natural Flavors, Contains less than 2% of the following: Sea Salt, Baking Soda, Palm Oil, Cellulose Gum, Xanthan Gum, Carrageenan, Sucralose, Sunflower Lecithin. Not as good as we had hoped, to be honest! This has a new carbohydrate named allulose, and we think it's much better used in Quest's Beyond Cereal Bars instead! 17 Grams Of Protein Per Bar! 10 Grams Of Fiber! 17 Grams Of Protein Per Bar! 10 Grams Of Fiber!17 Grams Of Protein Per Bar! 10 Grams Of Fiber! No Gluten Containing Ingredients. 17g Protein. 10g Fiber. 4g Net Carbs. YOU'VE GOT A HERO IN YOUR CORNER. Protein bars aren't supposed to taste this good. The Quest Hero Protein Bar is the next evolution in taste. We've managed to pack in 15-17 grams of protein per bar while maintaining only 4 grams of net carbs. 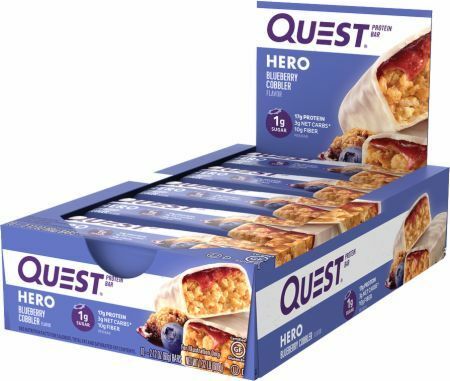 Every Quest Hero Bar features a sweet, protein-filled coating, an unbelievably delicious gooey filling and has a satisfyingly chewy Beyond Cereal Bar core. In the battle against bland protein bars and sugar-filled candy bars, you've got a Hero in your corner. Allulose is a "rare" sugar that is very different than "regular" sugar. It tastes like sugar but up to 100% of it passes through the body without being metabolized. It has almost zero calories (less than 0.4 calories/gram) and doesn't affect your body like "regular" sugar. Allulose is found in nature in many fruits and it's what makes Quest Hero Bars taste great without the extra net carbs and calories. Quest is on a mission to make foods that taste great and fit your macros. We are constantly striving to find the best ingredients with no nutritional compromise. Join us in our mission to revolutionize the way people eat and help us take the world #ONAQUEST.